NEW YORK -- She knew massive change was coming to her family, so Venus Williams recently purchased her own baby stroller. One of Williams' friends thought it was pretty funny. "That's not even your baby," Williams was told. But that's how excited Williams was about her sister Serena having a child -- Venus wanted her own stroller for those moments that she'd dote over her new niece. Their introductions will have to wait for a while, though. Venus is having herself quite a run at the US Open. Just after Serena gave birth Friday to her first child, a baby girl, Venus stepped onto center court and quickly sent off Maria Sakkari 6-3, 6-4 in third-round play at the US Open. It is generally hard to tell how much the elder Williams, 37, is enjoying herself because she is so cool and guarded. Friday was no exception. 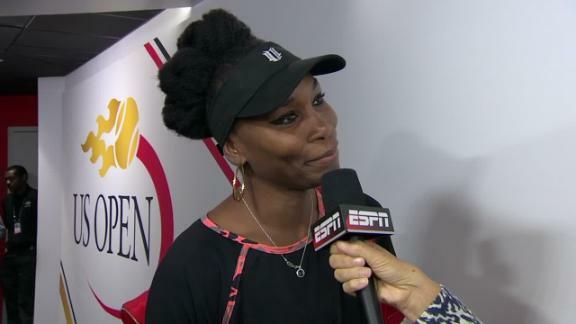 In her prematch ESPN interview, Williams said this about her sister's new arrival: "Obviously, I'm super-excited. Words can't describe." 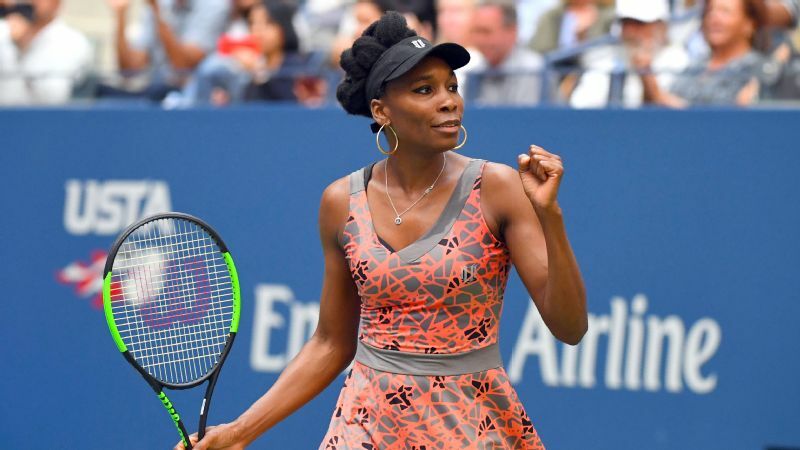 Despite the news of her new niece, Venus Williams kept her focus on tennis Friday at the US Open. But when she emerged more than an hour after her match, she said she wanted to answer only tennis-related questions. Technically, anything involving her sister, who has won 23 majors, is tennis-related, but Team Venus was fairly adamant about keeping this moment private. When pressed, Williams relented, just a bit, acknowledging that it was strange not seeing her mother, Oracene Price, or her sister Isha up in the players' box. They're fixtures at most of the Williams sisters' matches. She also said that she communicated with Serena before her match, not with texts or emojis but an actual phone call. She called the conversation "motivational." "We always talk," Williams said. "We always talk, so she's always encouraging me. ... From every step of the way, every match, always." A woman standing near the doorway who appeared to be a representative cut off any further questions about Serena, or the baby. Venus doesn't crave the spotlight, and she certainly didn't get it Friday. 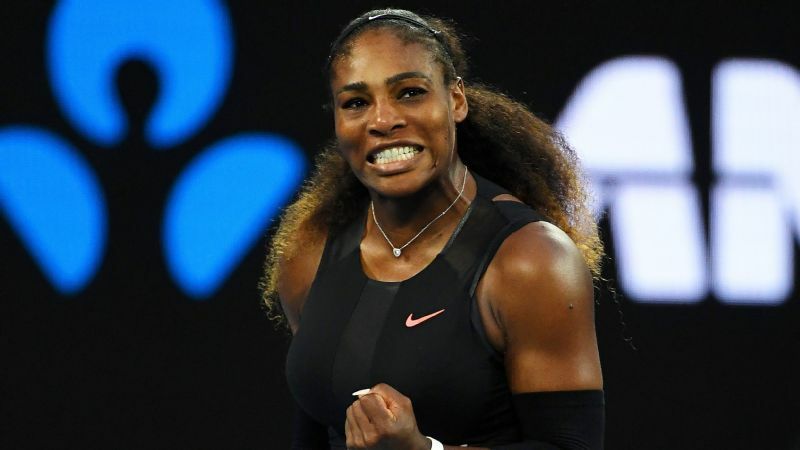 A few hours before her match, numerous reports surfaced of Serena in labor, with some publications saying that an entire floor of a West Palm Beach hospital was cleared for security purposes. Within hours after Serena's first baby with fiancé Alex Ohanian was born, the A-listers responded. Ciara tweeted out congratulations to "her girl." Twelve-hundred miles away, Serena was once again the biggest story of the US Open. But on the court at Arthur Ashe, Venus made a little noise herself. She advanced to the round of 16 for the fourth Grand Slam this year. She hasn't done that since 2010. She eliminated Sakkari, who's from Greece, in just an hour and 15 minutes despite having eight double faults and no service aces. Williams has put together a surprising year, overcoming injuries, Father Time and the day-to-day struggles of battling Sjogren's syndrome, an auto-immune disease. She made it the finals of Wimbledon in July and also was playing on the final day of the Australian Open in January, where she lost, of course, to Serena. "It's amazing what [Venus] goes through," said Esther Lee, a friend of both Venus and Serena who is their former physical therapist, "and you have no idea. People have no idea. It's really so on and off. She'll have some great days, and she'll have some tough days. It's really hard with an auto-immune disease to predict. Sometimes, your body just chooses to feel horrible." But Williams is feeling good, and Lee has noticed that her friend is enjoying herself a lot more. She saw it at the Australian Open, in the subtle things. An extra smile, a leap after a point. Williams hides it, but those closest to her can see how special this season is. She answers constant questions about her age, and that was the last topic of conversation Friday night, after the reporters were shut down on anything baby -- or Serena-related. She was asked what age meant to her. "I feel great, so to me, it's nothing," Williams said. "You have to have the desire to want to be here and you have to have the health. That's what you need ... Yeah, skill. Those three." When this last major of 2017 is finished, Williams will see her niece. There was speculation early Friday that Williams might leave New York to be with her sister, but Williams apparently had no plans to do that. She'll approach the off day before her Sunday match with Carla Suarez Navarro doing the usual things: practicing, going to the gym, stretching and eating right. "Yeah, they're so close," Lee said. "Their bond is incredible because there's no one else in the world who could understand what they go through. It's really sweet to see how they connect, how they really encourage one another. "But you can't forget that Venus is fighting for a Grand Slam, for her career."